70 Days Prayer and Fasting Program Starts today 09-05-2011. Fasting Instructions. Order Your Copy Now – Starting Today September 5th 2011. 1. On Mondays and Fridays, we shall break our fast at 5 p.m.
Children break at 12 PM (noon) each day. Please note: Memorizing the memory verse for each day is very necessary. A Mountain of Fire and Miracles Ministries Program. 1. By the power that divided the red sea, O God, arise and fight for me, in the name of Jesus. 2. By the power that slapped Herod with worms, O God, arise and fight for me, in the name of Jesus. 3. Any power that needs to die, for my life to become a positive wonder, die, in the name of Jesus. 4. Any power that needs to die, for my uncommon testimonies to appear, die, in the name of Jesus. 5. Every conspiracy, from the covens to kill me, backfire, in the name of Jesus. 6. Every power of bewitchment, assigned to pollute me, catch fire, in the name of Jesus. 7. Vision killers, I stop you before you stop me, in the name of Jesus. 8. Any wizard that must expire for my life to move forward, expire, in the name of Jesus. 9. Any problem assigned to kill me, arise, kill yourself, in the name of Jesus. 10. I unplug my body from the socket of death. I plug my body into the socket of the blood of Jesus. 11. Every power assigned to smite me dead, I smite you to death, in the name of Jesus. 12. Uzziah of my father’s house, die, in the name of Jesus. 13. Every vehicle, ordained unto death, clear away from my site, in the name of Jesus. 14. Habitations of cruelty, assigned against my existence, catch fire, in the name of Jesus. 15. Pursuing coffins, pursue your owner, in the name of Jesus. 16. Incurable infirmities, hear the word of the Lord, die, in the name of Jesus. 17. Arrows of spiritual poison, backfire, in the name of Jesus. 18. Progress killers, anointing killers, I kill you today, in the name of Jesus. 19. Every funeral procession, organized against my life, scatter, in the name of Jesus. 20. Sudden terminal attackers, die, in the name of Jesus. 21. Every strongman pursuing me as a trophy, die, in the name of Jesus. 22. I shall not die with my enemies, in the name of Jesus. 23. O Fourth Man in my fire, appear by fire, in the name of Jesus. 24. O wind of death, blow away. O wind of life, blow upon me, in the name of Jesus. 25. Any power pursing me into the red sea, die by the red sea, in the name of Jesus. 26. Domestic witchcraft, assigned to kill me, die, in the name of Jesus. 27. Every power assigned to kill my destiny, your cup of iniquity is full, die, in the name of Jesus. 28. Every court of Pharaoh assigned to challenge my God, scatter, in the name of Jesus. 29. Agents of the grave, summoned to appear in my dream, die, in the name of Jesus. 30. By the power that stoned Goliath to dead, O God, arise and fight for me, in the name of Jesus. 31. Serpents of God, appear, swallow every serpent of death assigned against me, in the name of Jesus. 32. Programs of death for my finances, die, in the name of Jesus. 33. Agenda of death for my destiny, die, in the name of Jesus. 34. My life, reject every serpent and scorpion, in the name of Jesus. 35. O thou that troubleth the Israel of Mountain of Fire and Miracles Ministries, the God of Elijah shall trouble you today. 36. Every enemy of the Mountain of Fire and Miracles Ministries, scatter, in the name of Jesus. 37. O God, arise and uproot anything You did not plant inside the Mountain of Fire and Miracles Ministries, in Jesus name. 38. Let the fire of revival fall upon Mountain of Fire and Miracles Ministries, in the name of Jesus. Click here to order your copy of 70day prayer and fasting book. Prayer Line: Call # 712-432-0075 – Pin 835555# Everyday. Marine witchcraft is one of the most destructive evil powers. Children of God must learn to deal with it. The annual seventy days prayer and fasting program organized by the MFM international ministries has begun. Every year, thousands of believers all over the world participate in this glorious program which has brought immeasurable and uncountable testimonies. Do you know that there are some problems which cannot be dislodged or dismantled until we apply the amazing power of prayer and fasting? Do not miss out on God’s promises in this area in this year 2011. Packed with over 1000 prayer points; each carefully broken down into strategic sections on: receiving fresh fire, marital joy and restoration, reversal of evil dreams and nightmare attacks, unlocking financial breakthroughs and prosperity, healing, divine promotion and more. Each day has a selected bible passage and 21 explosive prayer points for the day. You can also read the bible in 70 days by following the concise bible plan at the back of the book. The fasting book is divided into seven (7) sections of ten (10) days each, for easy spiritual navigation. On Mondays and Fridays you will break your fast by 5.00 pm while on other days, you will break your fast by 2.00 pm. Hurry as stock is limited!!! 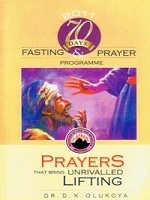 Order Your Copy of MFM 70-Days Prayer and Fasting Program 2011 Begins 9-5-11.